We’re three weeks into our summer break and we’re off to a great start. In typical fashion I panic the weeks before school being out and think I need to have a plan … “I need to come up with a plan to survive summer” I’ll say while pinning a bunch of stuff at night while Joel and I work on our laptops and watch tv. “Sounds good” He’ll say and then the weeks melt away and I’m staring at summer in the face with no solid plan in place. I decided at the very least, for my own sanity and theirs, that I wanted to get my crew out of the house for physical play at least once a day. To make things more interesting we’ve been trying to get more playdates with our twin buddies set up and we’ve been checking out new parks around town that we haven’t visited before. 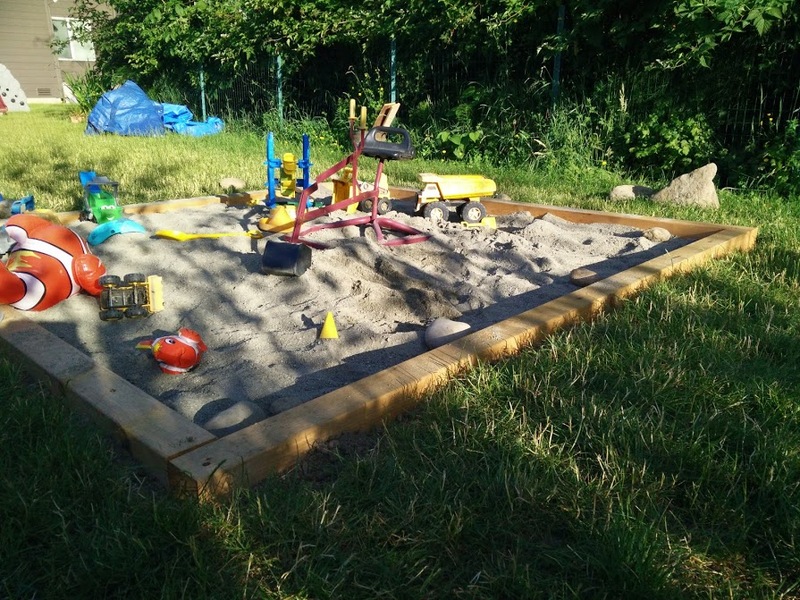 We also knocked a big item off our house bucket list and built a decent sandbox for the kids. Joel did all the work, I did all the nagging reminding and wrangling of children to try to stay out of the way. Using the plans from This Old House building a sandbox, (skip to the 3:30 mark to get past the fossil instructions) Joel took off and made it happen. We ordered builders sand from a local landscaping company and now have a beach quality pit. We can get it wet for building decent sand castles and there’s plenty of space for all three kids to dig at the same time. That is, when we can keep Alice in her own area and not throwing sand on her brothers’ heads. We’ve had two successful park visits this month. The first was to Picnic Point Park in Edmonds. It’s more of a beach access point but it was a great outing. There’s a decent sized parking lot and after making the trek up and over the train tracks using the pedestrian sky walk we made it to the rocky beach. The kids were stoked that there was an up close encounter of the ocean. Although Alice kept asking where the swings were. We got to see two trains go by while we were there for forty minutes. But the highlight of our outing was THROWING ROCKS AT THE WATER!!! I have never seen Alice (or the boys) spend so much time throwing. Their arms must have hurt that night. Alice threw and threw and threw rocks until she was just tuckered out. We watched the waves crashing on the beach, the seagulls flying overhead and talked about all the neat rocks we found before the kids chucked them into the water. We had the entire place to ourselves. Although as we were loading into the car to go home for lunch there were three mini vans of kiddos piling out to begin their day. Our other really fun outing was up to Marysville to meet with friends at Jennings Memorial Park. It has a huge parking lot and is an easy walk from the car to the play area. There are restrooms and picnic tables as well as benches and plenty of grassy area for running or throwing down a blanket. When we first arrived I was super stoked because there wasn’t a sole in site – the boys ran like the wind to the playground while Alice and I walked along with our picnic lunch. The excitement was short lived because right around the time our friends showed up so did 20 daycare kids. That was the third time that week where we just happened to pick a park at the exact time that a group of kids came from a daycare to take over the place. I get it. I do. All kids are deserving of an outing to the park. But do they really need to be there at the same time as I’m there with my three kids by myself? We had a great time and got to catch up with friends but it was definitely more stressful for me to keep an eye on Alice (and to be sure the boys stayed out of trouble) with twenty other kids running all over the place. There were a few close calls where Alice would get pushed over (by accident) by bigger kids running past her on the bridge or push past her at the top of a slide, but we made it out alive and it was a fun new park to check out. Now Alice has all kinds of new stories to share at the dinner table – there’s twisty slides, “too hot” swings, big big towers and lots a grass to tell Daddy all about. It’s been great to let the boys really play hard too – they can be loud and use their bodies to jump, climb and run.